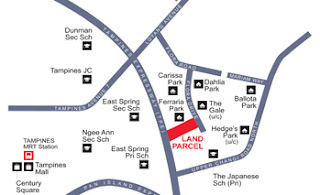 The Urban Redevelopment Authority (URA) has received four bids for a 99-year residential land site at Flora Drive. At the close of the tender today, the highest bid came from Frasers Centrepoint, which submitted a bid of $131.4 billion. This works out to about $3,499 per square metre. The next highest bid was from Tripartite Developers at $130.8 million or about $3,484 per square metre, followed by Leng Hoe Development at $123 million or $3,276 per square metre. Allgreen Properties submitted the lowest bid of $105.9 million or $2,820 per square metre. The site has an area of about 26,800 square metres and a maximum gross floor area of slightly above 37,500 square metres. It was launched for public tender on April 26. Commenting on the site, CB Richard Ellis (CBRE) said the land is surrounded by several condominiums such as Hedges Park and The Gale - which are both under construction - as well as Ferraria Park, Edelweiss Park and Dhalia Park. CBRE's executive director, Mr Li Hiaw Ho, said: "Its proximity to the Japanese Primary School will attract Japanese expatriates working in the industrial employment centres in the east." He added that the site could yield around 380 new apartments. "The top bid of $131.38 million or $325 psf ppr will translate to a breakeven cost of about $700 psf," he commented. Mr Li said the 501-unit Hedges Park condominium, which was launched for sale in April 2011, had over 60 per cent of it sold at a price of $850 to $900 psf. No Comment to " 4 Bids received for Flora Drive site "
No more "Real Estate Specialists" soon...? Shoebox units: A "hard sell"..? Whitley Heights enbloc: Sign of things to come? Balestier: Up & coming city fringe estate..? Interesting data on property "flips"
2013: Market crash or ghost towns? Does more GLS = Lower prices of new projects? Far East Organization - King of East Coast? Breaking News: Eunosville is now privatised!